Commander-in-Chief of Defence Services Senior General Min Aung Hlaing accorded a guard-of-honour welcome to Army General Sergey K.SHOIGU, Minister for Defence of Russian Federation, in front Zeyathiri Villa, here this afternoon. 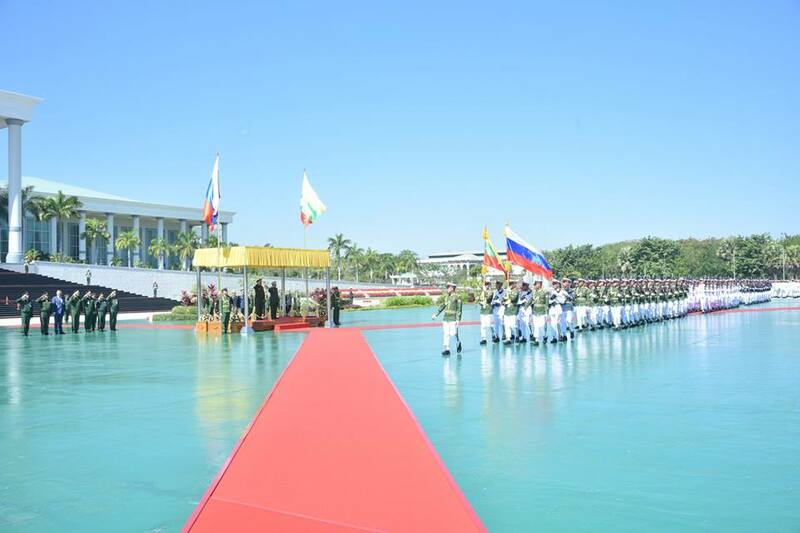 Senior General Min Aung Hlaing and Army General Sergey K.SHOIGU took the salute of the Guard of Honour and inspected it, followed by the bilateral introduction of senior military officers of both sides. Also present on the occasion together with the Senior General were Deputy Commander-in-Chief of Defence Services Commander-in-Chief (Army) Vice-Senior General Soe Win, Commander-in-Chief (Navy) Admiral Tin Aung San, Commander-in-Chief (Air) General Maung Maung Kyaw, senior military officers of the Office of the Commander-in-Chief and Deputy Minister for Defence Maj-Gen Myint Nwe. The Russian Defence Minister was accompanied by Ambassador of Russian Federation to Myanmar H.E. Dr. Nikolay A.LISTOPADOV, Deputy Defence Minister Lieutenant General Alexander V.FOMIN, senior Russian military officers and the Russian military attaché. The Russian Defence Minister signed the visitors’ book of Zeyathiri Villa and exchanged greetings with the Senior General at the parlour. At the Russia-Myanmar bilateral meeting, the Senior General said Russia and Myanmar are friendly countries. 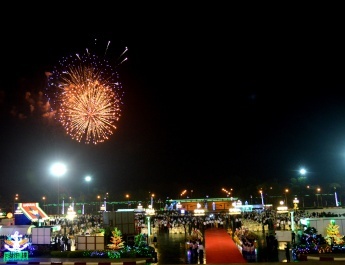 Since Myanmar regained independence, leaders of the two countries have been enjoying cordial relations. Although the two countries are far from one another bilateral relations are unique. Both should enhance bilateral relations that may significantly broaden the area of mutual cooperation. 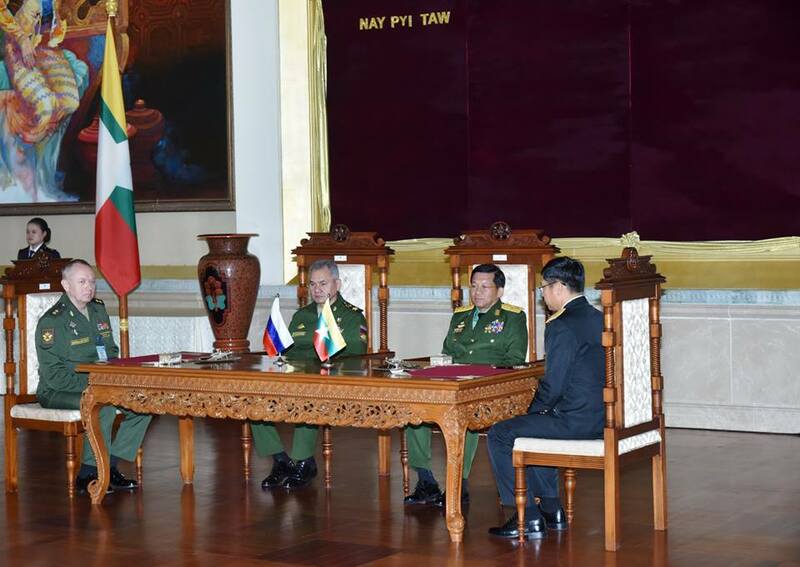 The Senior General thanked Russia’s stand on Myanmar’s reforms amidst the international community. The visiting minister said both countries would overcome difficulties through the mutual cooperation. The Russia would further promote military cooperation with Myanmar. 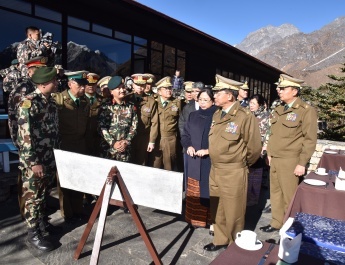 In addition, the armed forces of the two countries would promote amity and exchange of warship visits between the two navies. 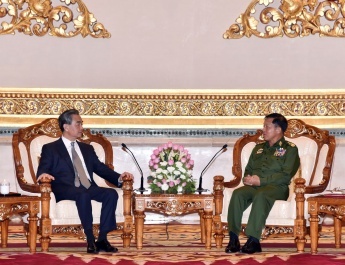 Afterwards, the Senior General said he thanked Russia for its stance towards Myanmar in the handling of terror attacks in Rakhine State by the Myanmar government and the Tatmadaw. The current terror attacks were found on social media every day. Those matters caused daily threats to the security, peace and stability of the world countries. Terrorists always carried out terror attacks in public areas. It was found that extremists were recruiting new attackers using social media. Both countries would cooperate in the fight against terrorism. Servicemen, security members, departmental staff and locals were brutally killed by ARSA extremist Bengali terrorists. Those terror attacks had undermined security, rule of law, territorial existence and the lives and property of the people. It was found that the acts done by ARSA extremist Bengali terrorists were aimed at hampering the rule of law processes in Myanmar. Terrorists were distributing fabrications so as to hide their terror acts they committed. They were trying to create a situation in which only security forces torture Bengalis. Some international community had made accusations against Myanmar and were trying to impose sanctions against Myanmar. Now the government and the Tatmadaw were working to restore the peace and stability in Rakhine State. The latter’s support and coexistence would be a force to go forward. The Russian Defence Minister said the terror attacks in Rakhine State were assumed to have political links. Myanmar government, the Tatmadaw and all citizens were to seek ways to deal with the problems. It might face difficulties. 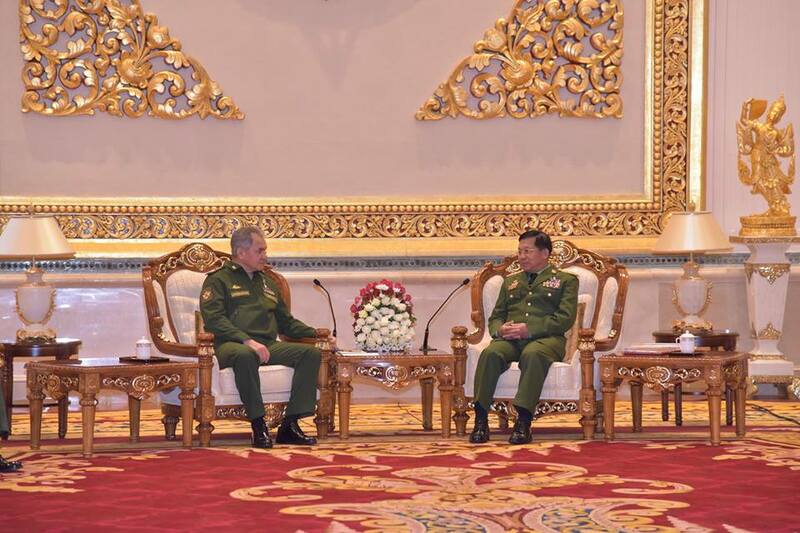 The Russian Defence Minister affirmed that the Russia’s State media would help Myanmar in order that international community understand the real situations in Myanmar. Next, the Senior General and the Russian Defence Minister cordially discussed military technological cooperation between the armed forces of the two countries, training cooperation, exchange of warship visits between the two navies, exchange of goodwill visits between the two armed forces and strengthening of bilateral relations between the two armed forces. 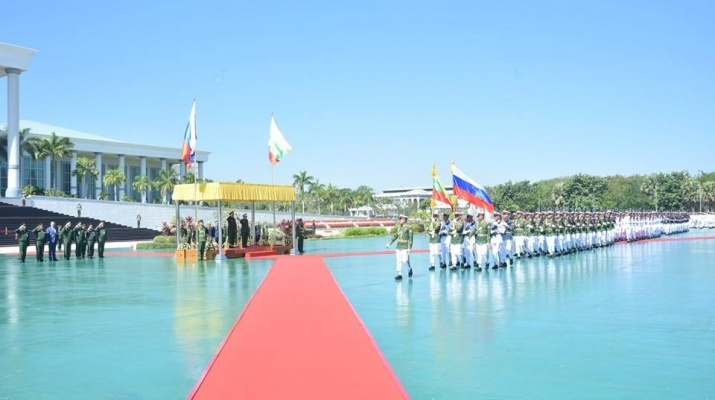 Then, a ceremony to sign a cooperation agreement between Russia and Myanmar’s Tatmadaw of the Republic of the Union of Myanmar took place, attended by Senior General Min Aung Hlaing and senior military officers, Russian Defence Minister Army General Sergey K.SHOIGU and officers from the Russian armed forces. 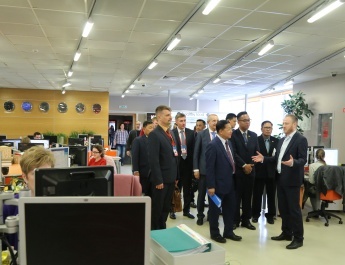 Deputy Minister for Defence Maj-Gen Myint Nwe and Russian Deputy Defence Minister Lieutenant General Alexander V. FOMIN signed the cooperation agreement and exchanged the documents. 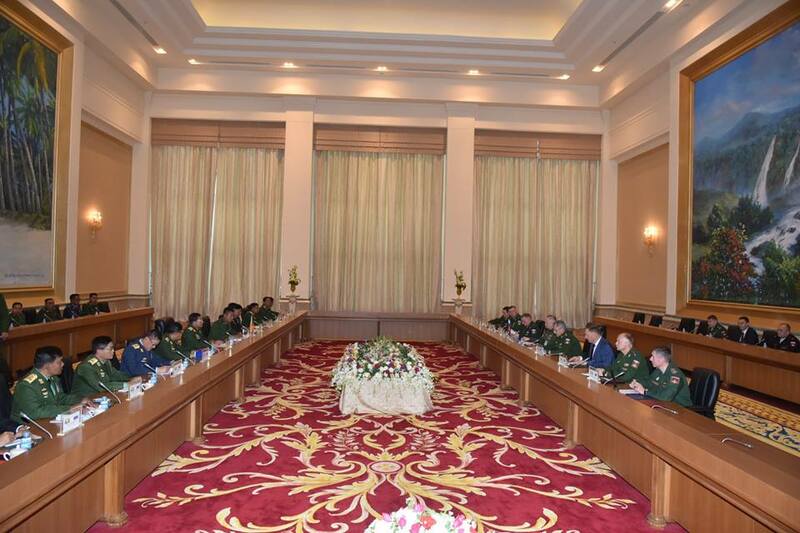 Senior General Min Aung Hlaing then hosted a luncheon in honour of Army General Sergey K.SHOIGU and party. During the lunch, the Myawady Entertainment Group of the Directorate of Public Relations and Psychological Warfare played songs of the two countries and performed a variety of dances. After the lunch, the Senior General and the Russian Defence Minister exchanged gifts and posed for a documentary photo together with those present. 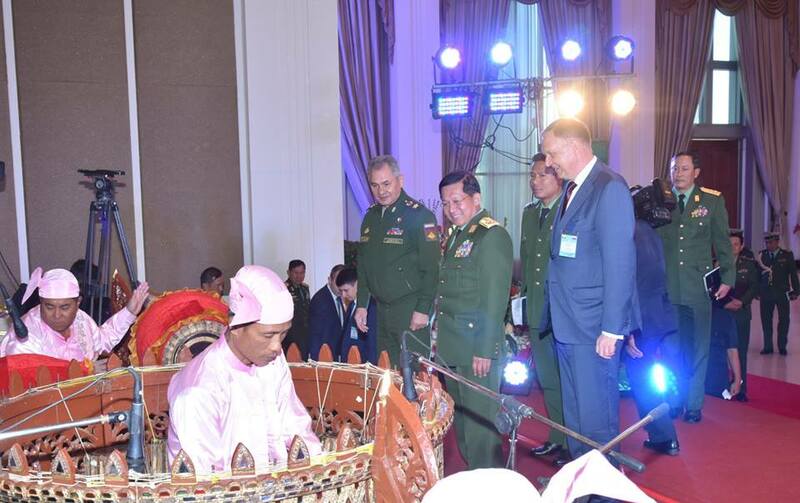 Later, the Russian Defence Minister interestingly studied and played Myanmar traditional orchestra.